The first thing you notice about Mil-Comm MC25 Cleaner/Degreaser is that it is nearly without a smell. There is a very faint scent to it that reminds me a bit of Granny “OJ’s Beauty Lotion” but it is very weak. There is none of the pungent petroleum solvent fumes that smell up the whole house which are characteristic of many of the traditional cleaning preparations like Hoppe’s No. 9. Like most people of my generation, I am programmed to think that a solvent couldn’t possibly clean gun crud and metal residue unless it was packed with explosive petroleum distillates and acids to eat the crud off. There’s no way that something that smell faintly like OJ’s Beauty Lotion is gonna’ clean my gun. Well, this stuff will surprise you. Not only does is clean quickly and easily without making your house smell like a Texas City refinery, it also removes copper fouling immediately, much quicker and easier than Hoppe’s. This eliminates the need for the use of a copper solvent in the barrel. The comparison between MC25 and MPro7 is inevitable. The are both environmentally friendly, water based, non-toxic and non-carcinogenic. MPro7 is an excellent product. I have used it and have a lot of respect for it. Not being a chemist, I can’t break the two down into their constituent properties and compare them molecule for molecule. I can only compare them on what I see and feel. MPro7 feels like a detergent, almost sticky. MC25 is just a liquid, neither sticky nor greasy. They both clean powder crud well. MC25 cleans the copper fouling better. The other inevitable comparison is with Break Free CLP. Really, it requires two of the Mil-Comm products, MC25 Cleaner/Degreaser and MC2500 Lubricant/Protectant, to give you all of the functions that Break Free CLP provides in a single solution. Here’s how I compare the two systems: On cleaning Mil-Comm has the edge. Break Free does not degrease and, in my opinion, MC25 does a better job of removing copper fouling quickly. Break Free gives you the whole system in one can; with Mil-Comm it is two bottles. But perhaps as important as any of the performance properties is the way my hands feel after using the two products. After using Break Free CLP, I have those weird and uncomfortable sensations in my skin which suggest that the stuff has penetrated my skin and is acting on my nerve endings, and I don’t like that. With the Mil-Comm system, I have none of those sensations, and for me that is a big plus. Mil-Comm products are non-toxic. I have taken to using grease on my slide rails and cocking lugs in auto pistols. The inevitable comparison here is with Mil-Tec. In terms of consistency, Mil-Com TW25B is almost like a cream. It works very well and I like it. Mil-Tec has more of the consistency of classic auto grease. I will leave the chemical comparisons to the engineers and chemists. My own thought is that if TW25B is good enough for the gatling guns on the F16, it will probably do all right on my pistols. See the list of TW25B specifiers listed below and I think you’ll be impressed. See also Mil-Comm Testimonials. TW-25B is a non-toxic, non-flammable synthetic grease that is easy to apply, and provides maximum performance lubrication under extreme conditions. TW-25B is highly effective for extreme pressure machine applications. TW-25B acts as an excellent corrosion barrier that will not wash off, burn off or evaporate. TW-25B greatly reduces parts wear, extends parts life and reduces maintenance frequency. With a wide operating temperature range between -90 degrees and +450 degrees Fahrenheit, TW-25B ranks as the most versatile extreme performance lubricant. From Jim: “We just trained a couple of S.F. “A-teams” who will be going into harms way. The first thing we did on both pistol and carbine day was to give a maintenance class and completely clean the weapons with Simple Green (something I picked up from the American Gunsmithing Institute) and applying a light coat of MIL-COMM TW25-B grease, then wiping off the white “carrier” just like the instructions state. MC-2500 oil is based on the same technology that gives TW-25B its fantastic performance characteristics, but in a pourable, pumbable oil form. MC-2500 permeates hard to reach places and is excellent for any close tolerance, high speed precision parts. MC-2500 is a non-toxic, non-flammable synthetic oil that is easy to apply, and delivers excellent lubrication and corrosion protection under extreme conditions for all metal and composite surfaces. Greatly reduces parts friction and wear. Extends parts life. Thrives in heavy load-bearing and extreme pressure conditions. Resists wash off, wear off, burn off and evaporation. Environmentally safe. Mil-Comm MC25 Firearm Cleaner/Degreaser MC-25 is an environmentally safe, water-based cleaner/degreaser that effectively cleans metal and composite firearms parts and accessories. It dries quickly and leaves the treated surface completely residue free. 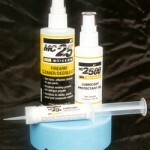 MC-25 is non flammable and contains no harmful solvents. Used in manufacturing and maintenance; recommended. Used to finish treat weapons in Factory Service. Used in manufacturing and service operations. Recommended specifically for the Sigma Series. Samples included with every new gun in the box. Recommended and used in manufacturing. Specified on the KAC silencer mount attachment. Specified for use on the GAU 19 gatling gun. Recommended on M-197 helicopter gatling guns. Used in manufacture of weapons systems. Specified and used on the Javelin missile optical guidance system. Specified for the Mark 75 autogun – NATO naval use. Specified on Avenger machine gun system – M3P 50 cal. Specified on the Mark 96 gun mount. In final testing stage for the 3- and 5-inch cannons. Used and recommended by instructors/armorers. Used on firearms and locks. Used by arrnorer’s shop on all serviced weapons.